After 12+ hours of play yesterday, the 7th day of the 2014 WSOP Main Event, the final table of 9 players was determined. The November Nine includes players from 6 countries including one country (Brazil) that has never been represented at the Final Table of the Main Event before. 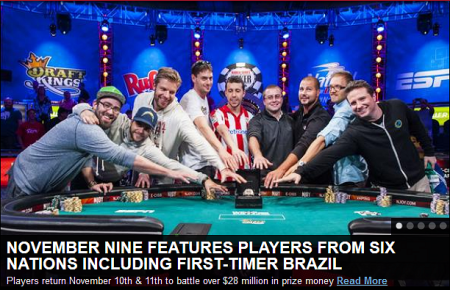 There are several players from the USA, and , of note is Mark Newhouse who made the November Nine for the second time in 2 years! An outstanding achievement that has not been accomplished since Dan Harrington did it in 2003-2004. Two-time WSOP bracelet winner Luis Velador of California went out on the bubble. He earned $565,193 for his 10th place finish. Of particular interest to the local readers, one final table player is from Massachusetts! It’s the player with the longest last name, William Pappaconstantinou. Mr. P. has won multiple world championships in foosball. (Search YouTube for Billy Pappas foosball). 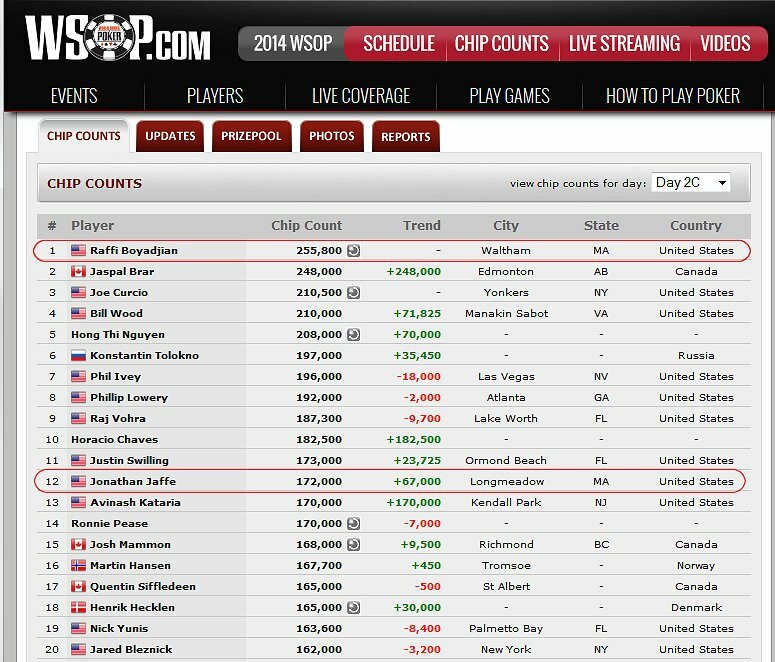 Poker players not in the Main Event had good-natured fun yesterday tweeting about, if this player made it to the final table, how the televised score board was going to be able to display his full last name and display everything else at the same time. I’m sure Billy is more focused on his poker play and big pay day! The Final Table of the 2014 WSOP Main Event will meet November 10, 2014 when the players will play down to the final two. The final two players will meet the next day and duel it out to become the 2014 WSOP Main Event champ and walk away with the $10,000,000 prize! It’s Day 2C of the 2014 WSOP Main Event. 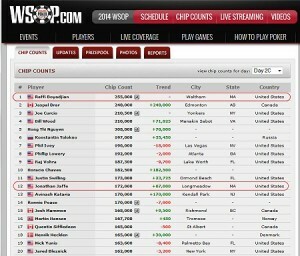 Happy to see that two Massachusetts poker players are currently in the top 12 (of the Day 2C players). At 6:30PM EST, Raffi Boyadjian of Waltham has the chip lead, and Jonathan Jaffee of Longmeadow is the 12th largest chip stack. UPDATE: Sadly, Chad passed away July 2, 2014. He had received the honorary bracelet and was wearing it. Condolences to his family and friends. Sad to learn that Chad Brown is in hospice. Tough guy fighting cancer for 3 – 4 years now. Thoughts and prayers to Chad Brown and his friends and family. Happy that the WSOP awarded Chad an honorary bracelet Saturday, June 28, 2014 for his contribution to the poker world. Earlier today, I was reading suggested posts by Tweeters and one post had this photo. It is a post well-worth reading, and included a photo that made my heart quiver with anticipation. 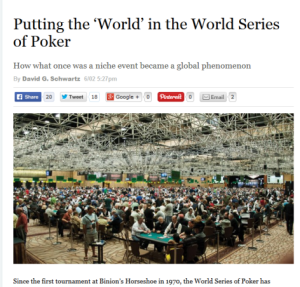 Click on the image to read the post, Putting the ‘World’ in the World Series of Poker. In the meantime, I am headed to Las Vegas in 2 days. RIO All-Suite Hotel & Casino, brace yourself. 2014 WSOP LIVE streaming schedule updated daily as soon as info is known. Not all final tables will be live streamed. See the schedule below. Final table start times will depend on the time the final table players were determined the day before. Follow @WSOP on Twitter or check the WSOP website each day to learn the start time of the live streams. Commentator will be Dave Tuchman (@TuckonSports). Live streams with audio only will be broadcast on a 5-minute delay, and live streams with audio and hole cards will be broadcast on a 30-minute delay. Some days, a secondary multi-camera live stream will play on a 5-minute delay. No audio. No hole cards. Just the featured table as the action unfolds. There are 65 tournaments in the 2014 WSOP Schedule. If you love playing No-Limit Hold’em, you have 37 opportunities to run for a bracelet; 3 fewer opportunities than in the 2013 WSOP. In addition to the 3 No Limit Hold’em tournaments that were eliminated, 1 Limit Hold’em and 1 Pot Limit Omaha were eliminated. Those 5 eliminations made room for the addition of 2 Omaha Hi-Low tournaments, a Dealer’s Choice tournament, a 7-Card Stud tournament, and a 7-Card Razz tournament. 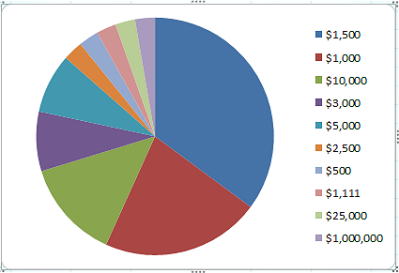 Here’s the breakdown of the tournaments in the 2014 WSOP Schedule. Over 50% of the tournaments are No-Limit Hold’em tournaments! Now that you know the game mix, what level tournaments will you play? 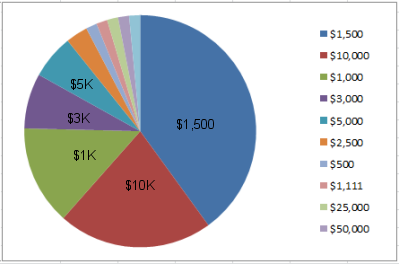 Here’s the breakdown of tournament buy ins in the 2014 WSOP. 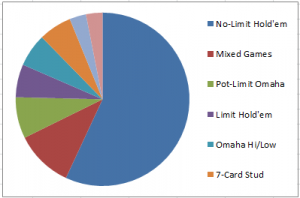 and if you are a No Limit Hold’em specialist, how many of the No Limit HE tournaments can your bankroll afford? Will you need to sell a part of yourself? The 45th Annual World Series of Poker starts May 27, 2014 at the Rio All-Suite Hotel & Casino in Las Vegas. (Official announcement (PDF)) Below is the schedule of tournaments. 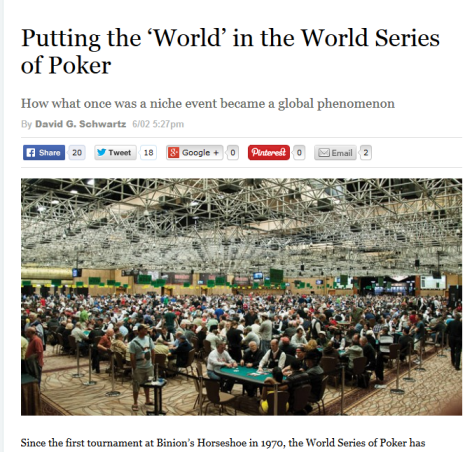 Registration for all tournaments = 2014 WSOP online registration. “Structure Sheet” links open PDFs. Noon $1,111 Event #62A: The Little One for One Drop No-Limit Hold’em ($111 goes to One Drop); 4-Day Tournament; Structure Sheett Unlimited re-entry during first six levels. Players who bust 62A, can enter 62B. Noon $1,111 Event #62B: The Little One for One Drop No-Limit Hold’em ($111 goes to One Drop); 4-Day Tournament; Structure SheetUnlimited re-entry first six levels. Players who busted 62A, can enter 62B.